Roger won the ATP Qatar Open in Doha for a third time by defeating Nikolay Davydenko 6-3 6-4, breaking serve once in each set comfortably to seal the win under the lights at the Khalifa Tennis Complex. Federer improved his record over Davydenko to 15-2 and now takes a week off before the first slam of the year. With this win it is the 67th title of his career and is a perfect start to the 2011 season going into the Australian Open. 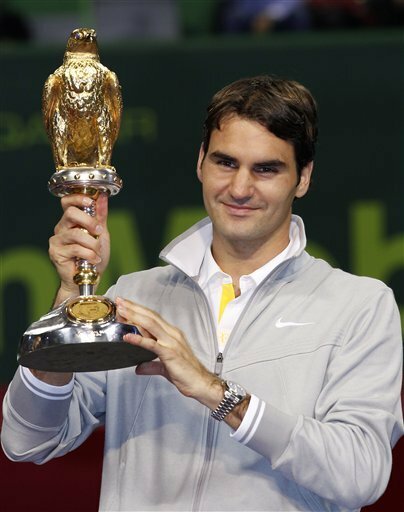 FedererFan07 on Facebook has the Doha 2011 album complete through the finals. Go there to check out the latest photos. There’s about one week to the Australian Open, in which I will try sharing with you the preparations and news on the tour, personal FedererFan07 videos from FedererFan07 on YouTube and FedererFan07 on Vimeo – in addition to a possible Roger Federer poster prize. More on that later. As always, I am open to hearing what your feedback is so please do tell me anything you think about the site, changes, or things you would like to see or read more about.